Twilight Garden Basket in Asheville NC - Merrimon Florist Inc.
To capture the gentle moment of twilight - when flowers in the garden seem to take on a mystical quality - send this mix of fresh blooms in shades of blue, green and lavender, presented in a woven basket. A wonderful gift for birthdays or any special occasion. 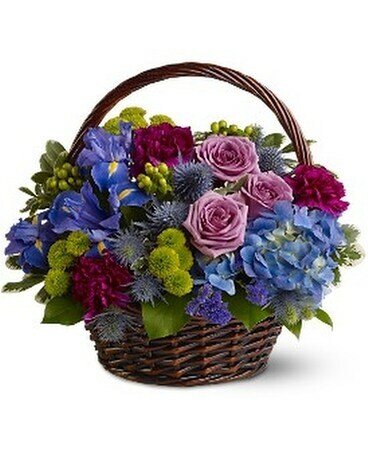 A mix of fresh flowers such as roses, hydrangea, irises and button spray chrysanthemums – in shades of blue, green, lavender and fuchsia – is accented with greenery and presented in a woven handled basket.